The U.S. container ship Maersk Alabama was taken hostage in 2009 by Somali pirates, the ship was on route to sail through the Gulf of Aden and around the Horn of Africa. 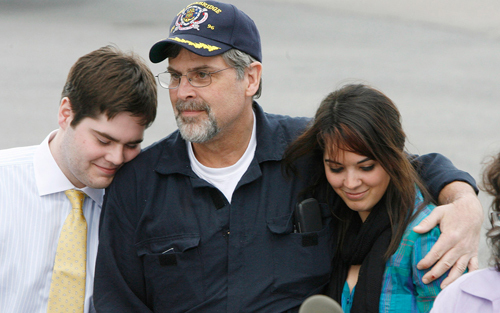 Commanding Officer, Captain Richard Phillips was in the thick of it all and lived to tell his heroic tale. The drama that ensued on this fateful trip inspired the movie Captain Phillips, directed by Paul Greengrass who has a journalism background himself, had a lot of elements of realism from a documentary standpoint. He blended the film with a realistic vantage point and action packed sequences. The film gives the viewer a lot of nuanced details about the two main characters lives. As Captain Phillips (Tom Hanks) starts his journey, with a nagging suspicion of piracy, since he had previously received alerts that there had been threats in the area, he sits down to write his wife (Catherine Keener) a small, simple email. As he writes his note, his feelings of trepidations come across, yet he leaves her a simple message telling her he loves her, almost ominous, yet heartfelt. In that moment alone we see a glimmer of stoicism and a peek as to who he is as a person. 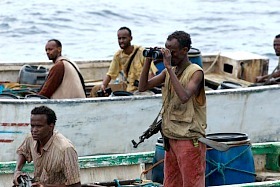 The leader of the pirates is Muse (Barkhad Abdi) and we also get insight into his life as well. The first shot of him is on the beach of his little town, with tons of people scrambling around. It is obvious he lives in a world much different than Capt. Phillips. In a sense, he has lived in a world where he has been brainwashed almost naively to believe that all Americans are millionaires and that alone, along with his boss’s threats, motivate him to act on his impulses. From there their two worlds emerge upon the ship as Muse and his band of marauders enter Phillips’ ship and threaten them with attacks for money. Captain Phillips is taken hostage and the rest of the film is devoted to the nightmare that was his capture and release. Movies that are based on real-life events or topics need to have a story that builds connections, develops characters and makes the viewer sit on the edge of their seats. This movie both succeeded and failed in this department. When a movie is based on a real life story or topic, for example, let’s take baseball movies, if the whole movie was like a baseball game it would be real boring, but what makes a good baseball movie like Bull Durham and Field of Dreams so good, is that it gives us great characters with back stories, character development and a story that connects with the viewer on some level. The first half of the movie, I was immersed, I felt the tension with the hand-held footage and even though like the Titanic, I knew what was going to happen, I was still on the edge of my seat. At one point Muse and Captain Phillips get into a dialogue that is intense and interesting. Captain Phillips tells Muse that he has 30 thousand dollars in the safe and that he can take it all to which Muse says, “Thirty thousand dollars? What am I? Do I look like a beggar?” Muse believes he deserves top dollar and thinks he can get millions out of them. Now this whole part of the story was captivating and entertaining and lead the viewer to believe that so many different things could happen from this point. The minute he entered the tiny vessel with his captors, the movie was like a fact telling docudrama. It was boring and honestly I could have been fine with just having watching the documentary on the History channel. 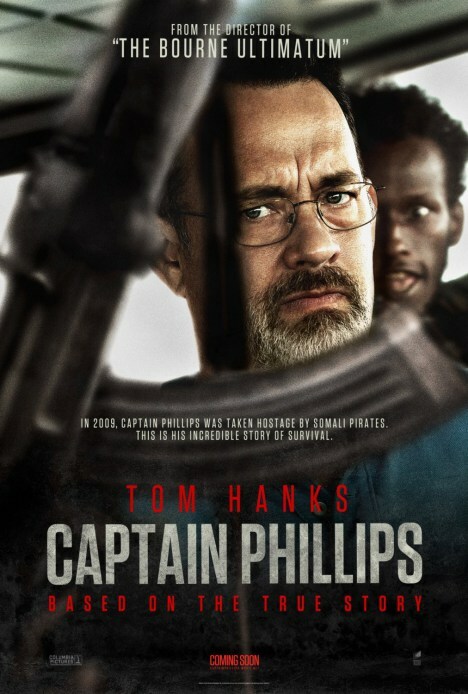 Hanks did a great job as the Captain and Abdi, I believe he deserves every praise he has received because he played that character with such grit and depth that he did seem like a real villain. Those two really stood out and honestly had it been another actor playing Phillips, this movie may have not received the recognition it did. Hanks amazes as always and he really showed emotion and played Phillips like a real human being, not as an over hyped up hero. I would have perhaps liked to have learned more about the bosses that Muse was entangled with, at least a few shots later in the movie focused on just them would have satisfied me. The story of Captain Phillips and his wife was very miniscule in the matter of things; it would have been nice to see more of that story. I felt like I was grasping for straws and getting nothing back in that arena. If they decided to show her, then they should have acted on that more or simply omitted her scene from the story. I will not argue the fact that Captain Phillips is a well made movie, Paul Greengrass knows how to direct an intense, action flick, but this movie lacked in other areas for me. The pacing of the film is off, which further disconnects the viewer and the narrative itself lacks creativity and depth. If you like action movies, then there are snippets of this that you will enjoy, but if you want to understand the entire story and really get into it, then it may be best to read the book. Would I see this movie again? Most likely not, simply said it did not entirely float my boat. I liked this movie but once was probably enough 🙂 nice work! I have to say I’ve been watching more stuff with Tom Hanks in and he is just amazing. Seems like the kind of actor that can make a movie even when the script can’t. I need to get to this soon as well. It looks good, but you don’t sound overly impressed. And honestly, Muse is just a very scary guy. Thanks Mesh! Glad you agree… I wasn’t sure if I was going to be the only one who didn’t love it. It’s funny, I didn’t really enjoy this one until the last 10 minutes, which I thought were amazing. I definitely agree with you about the last half – it was such a drastic shift in pacing and not in a good way! Thanks Devin, glad you agree as well. I did like the very end I should have mentioned that, but at that point, I didn’t really care as much what happened. Great review, Melissa. : ) I’m in total agreement. Good but not GREAT. Agree it’s much better before he ends up on the smaller vessel. I was just hoping for a slightly better movie as it was an Oscar contender. It certainly wasn’t bad, though. Thank you! That’s how I felt like should I be liking this more or what is wrong with me. Lol. Exactly good not great, first part was fun, exciting to watch then i just lots the connection with it. Hi, I like your blog. Great review. I myself wondered where ‘Captain Phillips’ started to feel too ‘documdrama’ like. I think you hit the nail on the head. When Phillips left the ship, the movie no longer felt like a movie. It lost a little bit of steam after that. I did like how the director showed some of the perspective of the pirates, like one of the young pirates being so poor as to not own a pair of shoes. Overall it was a good film, but like you, I would not want to see it again. Thank you I appreciate your comment. I really would have like to have seen more of the story of the pirates or even just Muse if that’s all they could have time to show. Something … I wanted more! Great review! For some reason when I saw this on the big screen I wasn’t bored at all, in fact I was on the edge of my seat pretty much the whole time. I was impressed by Hanks esp the finale scenes, and Barkhad Abdi was able to hold his own and this is his first acting job! Yes I am sure watching it in the theater always adds that extra element, especially since I am sure that is how it was meant to be watched. I didn’t hate it completely, just didn’t think it was great. Yes those 2 actors did a fabulous job. It’s awe inspiring that Abdi never acted before this, almost unbelievable. “…simply said it did not entirely float my boat.” HA. I see what you did there. 😉 I haven’t seen this, and I may check it out at some point, but I think I might end up feeling the same. Nice review, lady! LOL I know I am corny right?! Hey you may end up liking it, so it is worth a shot. Great review, Melissa. I completely agree. The actors are good, and Hanks is astonishing. But the second half fails to live up to the first. Thank you! I am glad you agree on that with me. I share your sentiments. I just wasn’t particularly interested, and the cat and mouse aspect even in the first half bored me after a bit. Though that first half is markedly better than the second. And I hated the directing. Though overused, I generally can live with shaky cam more than others. I guess it is truly not shaky and more handheld, but it felt out of place and unneeded. But Hanks is good, and so is Abdi. But honestly, I was most intrigued with the pirate Najee. I believe that he brought an physical intensity that no other pirate could match. He also has a more marketable look than some of the others. Thanks for the comment I appreciate it! I am glad that you agreed with me. I also wanted to see more of the pirates’ stories and know who they were, what else motivated them… something … I think those other elements would have made for a better film. I still really want to see this! Awesome write up lady! Z girl yes it totally is worth watching, at least once I think you have to at least be able to say you saw it and you either liked it or not. You may like it, I would love to hear your thoughts when you see it! I will be sure to let you know! good job, i watched this movie, worth of watch but only once…..